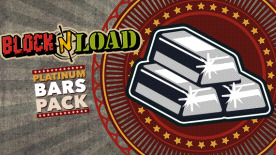 Want to get a great special rate on Platinum Bars to spend in Block N Load? This Platinum Pack DLC will give you a one-time price for 560 Platinum to spend. Choose from heroes or skins and upgrade your in-game options today. This content requires the base game Block N Load in order to play.